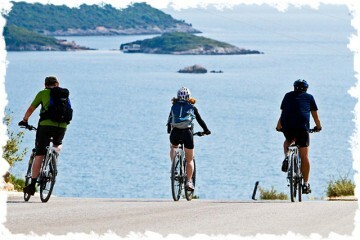 Enjoy the active adventure of Albania by bike. 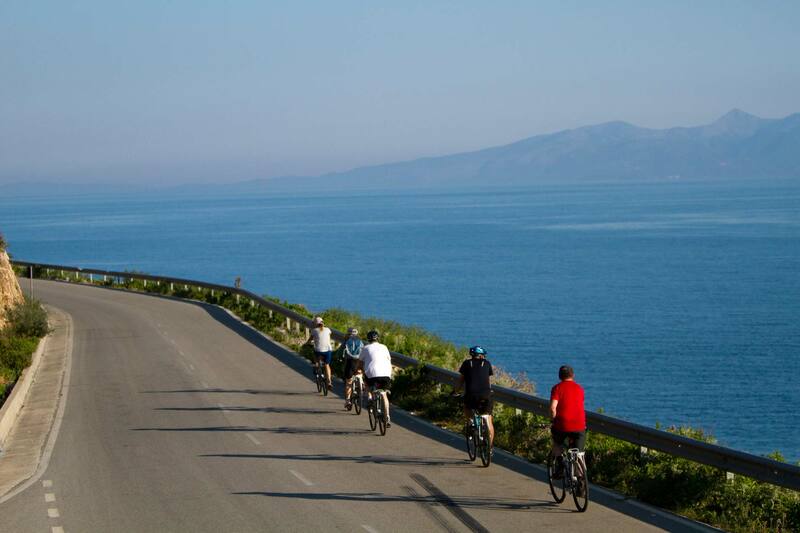 This tour is for fit people who enjoy cycling into the nature and history of the southern coast, known as the “Albanian Riviera”. We will pass through scenic natural parks, home to some of Albania’s most astounding landscapes. 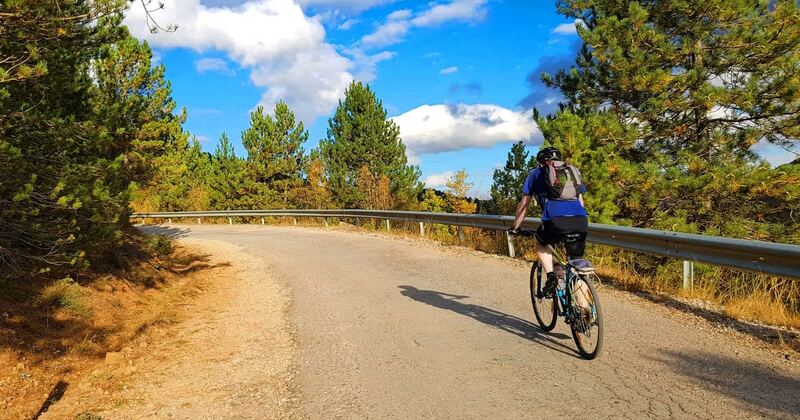 We will visit fascinating UNESCO World Heritage Sites, stop in picturesque villages, and most of all enjoy the active adventure of Albania by bike. These tours can be physically challenging, and demand you to be in good physical shape. The roads are not always in the best of conditions and may contain some big ascents and descents. Prior cycling experience is an advantage, but not necessary for those who are in good shape. You must remember that you will bike with a group of people, partially in city traffic, so you will be moving in single file formation and proceeding quite slowly in the pedestrian area. Also, you must remember that it’s always better to stop when you are not sure how to interpret the signs or moves of other vehicles on the street. The “OA” tours are Land Only; the prices do not include your flight, nor transport to and from the airport to hotel. You must make your own way to the starting point of every tour. If you would like us to arrange a transfer for you from the airport to your hotel or from your hotel to the beginning point of the tour, please let us know at booking or contact us via the enquiry form. Children joining this tour should have experience with cycling. Children under 18 should be accompanied by an adult. persons you know, please let us know at booking. You can either bring your own bike, or rent a bike from us. What is the cost for a rental bike? or pay a small group supplement. bike. The min age for set departure tours is 18. How will the luggage be transported? This tour has a support vehicle to carry the luggage and, when needed, up to 4 bikes and riders. We will meet in Tirana from where we will have a transfer to Pogradec, a small city in the east of the country situated at the magnificent lake of Ohrid. Free time to make a walk along the boulevard in the afternoon before dinner. This morning we leave the lake behind us, and climb to an elevated plateau enjoying some great views on the blue waters of the majestic lake surrounded by mountains. 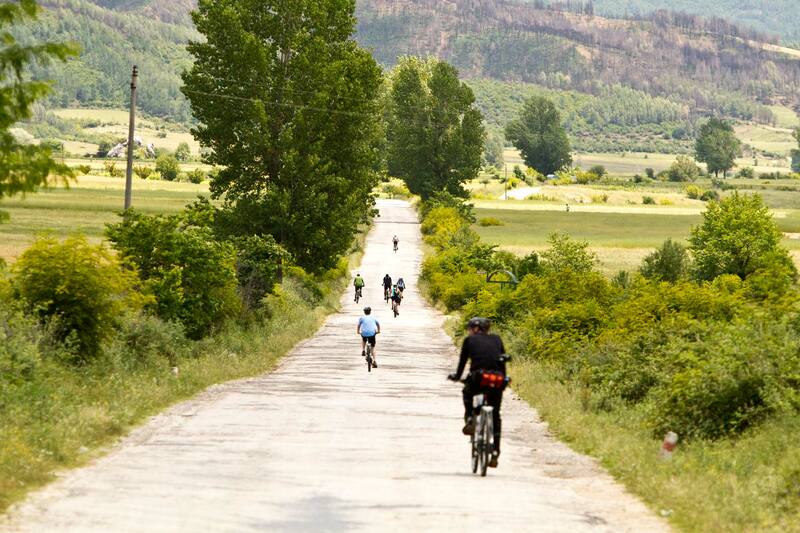 The road then continues towards Korça pedaling through vast fields, and small farms. Upon arrival in Korca there will be some time to make an evening stroll in the center along the highlights of the city before dinner. At dinner you might want to try a glass of the famous locally-brew Korca beer. After a good breakfast we will leave behind the agricultural plateau of Korce, climbing steadily into the border mountains through a diverse landscape. Numerous cols and valleys lie ahead, climbing into the heart of the Grammoz Mountains and over the Barmash Pass(1159m) to Germenj lying in its own tranquil valley. Upon arrival there will be some free time until we have a dinner of local specialties. Our final destination for today is the picturesque village of Permet. We will climb out from Germenj to a high grassy plateau surrounded by soaring peaks before reaching the source of the Vjosa River. Then we’ll coast down through a spectacular gorge, which we will follow until we reach the village of Permet, situated on a bluff above the river. We will start the day by continuing our route along the valley towards Kelcyra (the distant shark’s tooth peaks), which guard another gorge. Ride between them to the concourse of the Drinos river, following yet another gorge. The gorge opens up into a wide plain near the town of Gjirokastra, also known as the city of a thousand steps. We will wander through the narrow cobbled streets of this UNESCO World Heritage city, famous for its Ottoman architecture, until it is time for dinner. Short transfer to Qafe Muzine and from here cycle to the Blue Eye spring and latter to the archeological UNESCO World Heritage site of Butrint one of the country’s most important archaeological treasures, where the influences of various ancient people are clearly visible. After a guided tour in Butrint, we will make our way along the coast heading north with the island of Corfu always at your site until we reach our hotel in the city of Saranda. We start climbing steeply out of Saranda to a rocky plateau. Then it’s over hills and into bays and around headlands, keeping the stunning mountain scenery to the right and sea to the left before descending to the long beach and the bay of Qeparo. Optional evening walk to the old village of Qeparo on top of the hill to enjoy a wonderful sunset. Today we will head further north along the coast, climbing over several cols through woodlands, wee gorges, forests and hairpin bends and on the descent to the most famous beach in Albania, Dhermi beach. After a lunch at the beach we will have a transfer to Berat, “the city of a thousand windows”. This is perhaps the most beautiful town in Albania, with its cobbled alleys between the white-walled houses and the old fortress. We will enjoy the rest of the afternoon wondering through the old streets before dinner. Overnight in hotel in Berat. Before we head back to Tirana this morning, we pay a visit to the Onufri Iconographic Museum, located in the sanctuary of St Mary’s Church in the inhabited quarter of Berat Castle. Home to a remarkable collection of religious paintings, the museum is named after a famous 16th century icon painter whose works were characterized by post-Byzantine and Venetian influences. We will then return to Tirana where the tour ends.